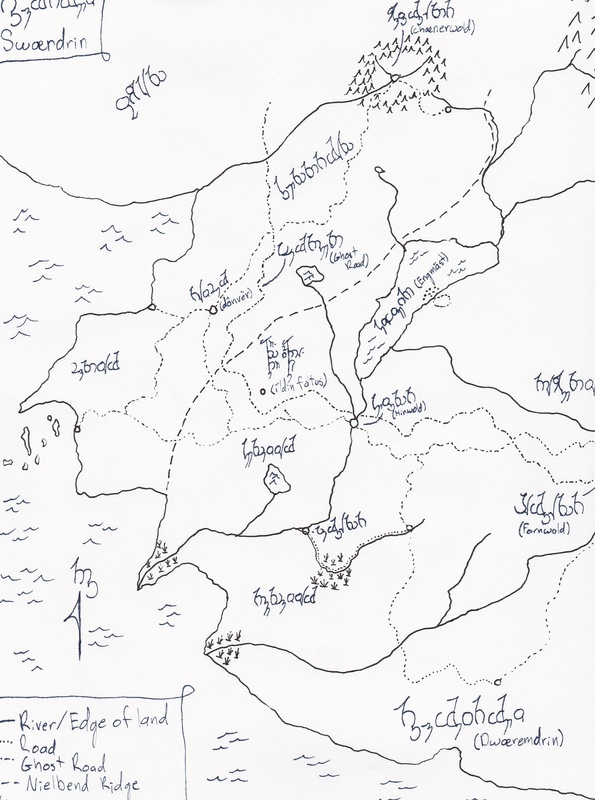 This is the (poorly drawn) map of one part of the world in which my story takes place. I also have two others to go along with this. The general scale of the land mass is something like 400mi east to west and 500 north to south. The darn scanner cut off the right hand side, but not much is missing, just a long mountain range. Yes, it’s busy and got lots of stuff. Part of the purpose of this map is to serve as notes, but part is to serve as inspiration to myself. This is why everything is mostly written in the languages I created. Anyhow, world-building really is my favorite part, and having an interesting and unique place for my story to take place seems essential. Plus it’s sort of an expected thing for a fantasy, right? This entry was posted in fantasy world building and tagged constructed languages, fantasy world building, fantasy writing, fictional maps.